Arsenal has added another leg of their 2012 Asia Tour; they will take on Hong Kong First Division champions Kitchee FC, in Hong Kong. The game will be played on July 29, 2012 at Hong Kong Stadium, which will be two days after facing Manchester City in Beijing. This is another fantastic opportunity for the Gunners to strengthen their ties in Asia. Something they may want to consider if they want to keep their stronghold in the Asian market is to start playing South Korean captain Ju Young Park, who has rarely featured for Arsenal this season. 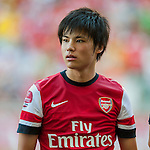 The acquisition of Park for a fee of around £6 million has left the Gunners fans bemused. Either Arsene Wenger is still trying to help the South Korean adapt to the English game, or Park doesn’t have enough talent to be a star for Arsenal. My bet is the latter.
" It’s great that Arsenal Football Club is visiting Hong Kong again after 17 years.We have many followers in Hong Kong and it’s wonderful that these special fans will have an opportunity to see the first-team live in action. The match will follow on from our visit to Beijing, where we play Manchester City in the Bird’s Nest, and is another indication of Arsenal’s commitment to Asia." It will be a fantastic experience for Asian football fans that get to see some of their favourite Arsenal stars up front and close for maybe the first time.